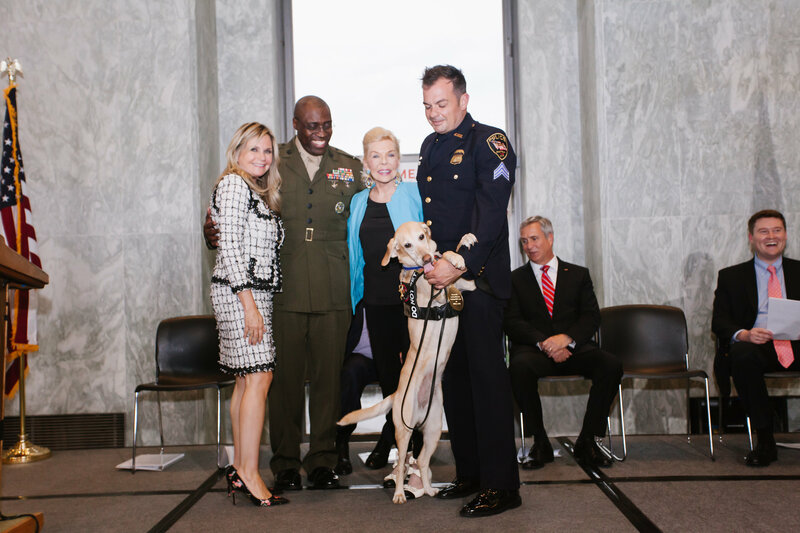 Philanthropist and veterans advocate Lois Pope shook a lot of hands – and, more importantly, paws – as she presented four heroic military dogs with the nation’s highest honor for canine service to our country in a special ceremony on Capitol Hill on Tuesday, May 23. With top military leaders and 200 members of Congress and Congressional staff looking on, Mrs. Pope, together with U.S. Navy Rear Admiral Thomas Kearney (Ret.) and U.S. Marine Corps Colonel Zachary White, bestowed on the courageous canines the 2018 American Humane Lois Pope K-9 Medal of Courage. The medals are presented annually to a select few outstanding military dogs for their extraordinary valor and service. They were conceived of by Mrs. Pope and created under the aegis of American Humane, the country’s first national humane organization, which has worked with the U.S. military for 100 years. recent surgery and this warrior is now living out the rest of her days free of pain, just as she deserves. country. Summer retired from the military but continues her selfless dedication to protecting our country. Today, she works as a member of a TSA K-9 team for the Amtrak Police Department in Washington, D.C., with her partner, retired U.S. Air Force Sergeant Micah Jones. The inseparable pair has provided coverage and security for VIPs and foreign dignitaries and works each day to play a vital role in the war against terrorism. military animals. For more information, please visit www.AmericanHumane.org.